Firmly rooted in the St. Cloud community, the general practice law firm of Pennington, Cherne, Gaarder & Geiger Hagen, PLLC, provides legal services throughout central Minnesota. With more than 57 years of combined legal experience, you can trust that our three attorneys are well-equipped to handle any matter. 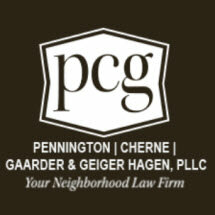 At Pennington, Cherne, Gaarder & Geiger Hagen, PLLC, we handle your legal issues with competency and professionalism, whether it involves dealing with insurance companies in a personal injury claim, presenting a compelling defense to criminal charges or working toward a long-term solution for a family law matter. Our philosophy is to work toward a solution that is in your best interests, from the legal result to the cost of our representation. On the other hand, we are proud to leave the "lawyerly" attitude in the courtroom where it belongs. From the moment you walk through our door, you are greeted by an approachable team of attorneys and staff members who genuinely respect you. We never promise results on which we cannot deliver. We do, however, promise to provide you with honest, straightforward advice in an atmosphere that makes you feel more like a partner than a client. If you would like to work with a law firm that truly puts you first, simply give us a call. We will schedule an appointment that works for you.